No messing around tonight on the Midnight Tracker. We need to jolt this thing back to life, and there’s only one way to do that. In a mere 15 minutes, the Killer rips through covers of tunes by Little Richard, Charlie Rich, Chuck Berry, Elvis Presley and Ray Charles. The kids scream as he blows up “Hound Dog,” flipping out and abandoning the lyrics about halfway through. He starts chanting “They told me you was high class” over and over, then “Nothing but a hound dog, just an old hound dog” over and over. The side ends with “I Got A Woman,” is mostly a wild instrumental rave-up, getting the kids jacked up for the rest of the show. They recorded this on July 18, 1964, a Saturday night. (The liner notes incorrectly say July 1.) To hear this astonishing side, Jerry Lee Lewis clearly brought the greatest live show on Earth to town that night. 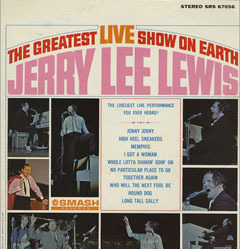 “Jenny, Jenny,” “Who Will The Next Fool Be,” “Memphis,” “Hound Dog” and “I Got A Woman,” Jerry Lee Lewis, from “The Greatest Live Show On Earth,” 1964. This is Side 1. It runs 14:58.